Are you waiting to file your truck tax form 2290? IRS is started accepting 2290 tax returns from July 1st to August 31st for the 2017-18 tax year. E-file now with our partner website etax2290. Like the previous tax filing season, the present tax season for 2017-18 is hurrying with high speed and the tax filers are filing their Form 2290. Are you the one still searching for a perfect tax service provider to file your HVUT tax for the financial year 2017-18? Then your search ends here at Etax2290. Etax2290 as an IRS authorized tax service provider with immense experience in the taxation field started accepting 2290 tax returns for 2017-18. Do you want to know why our customers continuously prefer our service? Then you must read on. As a trucker, you are always on a move, so you do not find ample time to file your Heavy Vehicle Use Tax (HVUT) on time. Etax2290.com understands your situation better and provides a complete Mobile friendly site. Hence, you can fill Form 2290on the go from anywhere and anytime. Etax2290.com provides free VIN Correction for their valuable customers. To opt this free service the customers can contact etax2290 via e-mail or call us. Once the request is placed, etax2290.com processes the application and takes essential steps to make sure that the IRS does not double charge the tax to the customers. Filing Form 2290 through etax2290.com is simple and it is 4 Step Process. For a new customer, you need to register for FREE, Login into your account, Fill the tax details, and submit the information. We ensure that our tax professional customers get exclusive pricing. As a tax professional, we would like to compliment your tax filing with better pricing rates. Each-filer has a single account access, which allows unlimited filings under that account. The tax filer can store all the information that is related to tax filing and can retrieve back later. All the information is kept in order and secures from any third party access. Etax2290 electronic filing service makes e-filing process a lot easier and quicker as etax2290 offers a user-friendly interface. We save much of your time and effort as you know need to wait in IRS office queue. According to the guidelines of IRS when you are filing tax for more than 25 vehicles, it is mandatory to file them electronically. It may be hectic when filing tax returns or Form 2290 for a dozen of fleets. However, etax2290.com offers a better way to file, we offer bulk upload feature, which allows the tax professionals to upload hundreds of trucks in minutes. In addition, more importantly, you can discount for bulk filing. Etax2290 offers the customers a relaxing experience when you follow our documented instructions and review on-screen hints. The rates at Etax2290 are very nominal and we do not overcharge. We provide offers at regular intervals to benefit our valued customers.Still, you need more discounts. Then Like us on Facebook and get $5 off on your filing fee. The tax amount is calculated instantly after you have filled the tax details and our tax experts ensure that the truck tax amount is accurate before reporting the IRS. If you are stuck up in middle of the filing process? Etax2290.com have 24/7 online support to guide you throughout the filing process. Alternatively, you can call us at 703 229 0326. Remember that you are only a call away from a team of experienced tax experts and e-file specialists. For detailed instructions about filing Form 2290, recent updates of IRS rules and IRS contact numbers, check our etax2290 FAQ section. Overall, you will get a professional tax filing experience with us. Stop worrying about the tax calculations; call our customer team support at 703 229 0326 immediately to file your Form 2290 for 2017-18 before the deadline. If you have queries while filing Form 2290 tax return simply send a mail to support@tax2efile.com or live chat button (24/7 available). Why Didn't You File Your 2290 in Pre Filing Season? If you are not filed your HVUT Form 2290 in pre filing season, then no worries. Here Etax2290 will guide you to e-file 2290 Form and receive stamped Schedule 1 in minutes without delay and any waiting. While many of us are busy in filling 2290 tax returns, there are people who find reasons for not filing. The number of defaulters is increasing considerably every year. According to a report, more than 10 million people were expected to file their returns late. There are countless reasons and excuses are increasing every year to justify the decision to file late or not file at all. However, such excuses are not considered by the IRS and at times they could land you in jail or attract penalties. Let us check out the most popular reasons for filing late or not filing the truck tax returns. Laziness is the most common reason for not filing or late filing. The IRS never sends notice or agents to you when you fail to file the tax return. Amidst the busy schedule, few people do not consider that filing the tax is important and plans to file them later. As the days pass, it becomes too late to file the tax, which leads to penalties. When you did not file the tax, somehow you will be tracked and it is not acceptable by the IRS. If you are deployed in connection active military service internationally, you are eligible for filing extensions for your tax returns. eHow.com states that “if you were in the duty zone, you no need to submit any additional forms as the Department of Defense shares your SSN and the names.” However, it is better to check whether the exemption is applicable to you. When you can prove that your tax or tax-related financial documents are destroyed, the IRS grants you special permission. For instance, if your house is burnt in the fire accident and if you have enough evidence to prove it, you no need to pay penalties for filing late. But note that, the IRS confirms whether the records are destroyed accidentally or intentionally. An eyewitness, police records, and photographs can help you in such condition. Having discussed the late filing or not filing the HVUT Form 2290, it becomes important to check out the benefits of Pre-filing your tax returns. The IRS has introduced this pre-filing concept to reduce the burden on the taxpayers. Listing the benefits of pre-filing Form 2290. 1. When you are pre-filing Form 2290, you have 2 months of time to make changes in the Form, amendment and refile your tax returns if the form is rejected. 2. Can make corrections on the rejected forms and report them back on time before the deadline. 3. No worries about the penalties for the late tax filing and reduce the burden from your work schedule. 4. Receive your stamped Schedule 1 before anyone else. 5. Pre-filing never costs anything extra. Just you are filing the tax returns ahead with no extra fee. 6. Avoid the virtual e-file traffic at the last minute of filing your Form 2290. 7. Pre-filing lets you to file the tax returns now and pay the tax amount by the deadline. So you have plenty of time to allocate the tax amount as you got the tax calculations earlier. If you not filed in pre filing season, no need to worry. The 2290 regular season started from July 1st to August 31 for the 2017-2018 tax year. Etax2290 helps you to e-file your HVUT Form 2290 and receive your stamped Schedule 1 in minutes. No need to rush out in the 2290 season. Happy Filing! E-filing HVUT Form 2290 with ETax2290 with Discount Coupons! Etax2290 started e-filing your HVUT Form 2290 for the tax year 2017-18. You can pre-file your IRS 2290 Form through etax2290 electronically. We have your tax filing safe and secured. When the IRS starts receiving the HVUT Form 2290, our system submits your electronically filed tax return to the IRS. When the IRS accepts your Form 2290 you will be notified and you will receive stamped Schedule 1 in your email. As an experienced tax filer, you might be aware of the benefits of pre-filing and it is time to act fast and pre-file your IRS 2290 Form. This year Etax2290 complements its valuable customers in this e-filing 2017 to 18 tax season with a discount of flat 25% discount on the Single Truck filing fee. Exciting, right? How to get this offer and the discount coupon? It is very simple. All you have to do is to like our Facebook page to get this discount coupon. A single “like” earns you $5 discount. So what are waiting for? Just hit “like” and avail your discount. Apart from that, you can avail flat 25% off on Form 2290 E-file Fee. For more details contact our customer support team. And also w are offering FLAT %15 discount, Use promo code 2017ET15 while e-filing your HVUT Form 2290. We have discount/coupon section before IRS payment process, Use this promo code and get less cost for your form filing with us. How to Avail the Discount Coupon? 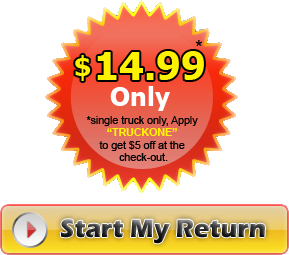 To avail $5 discount for Single Truck Filing Fee. Proceed with the following steps. 2. Like the page Etax2290. 3. Go to the Coupons section, which is available in the left section of the page. 4. Click on Get Coupon. 5. When you do so, a redemption code will be provided. This voucher has a created date and Expiry Date. 6. You can print the voucher if needed. 7. Importantly, you can share the offer with your friends by posting this on wall, twitter or through the mail. All you have to do is, click the appropriate button to share. 8. Now you have obtained the coupon code to apply while filing single truck. So that, the filing fee $5 amount will be reduced from $19.99. 9. Log in to Etax2290.com. · Pay for the service. 11. In the pay for service tab, you can find “Discount on your payment”. You can fill the Coupon Code in the given text box and click Get Discount. 12. The payment after discount appears in the text field. Then you can fill the Credit Card and Billing information and click pay now. 13. Now you are done with your HVUT e-filing 2290 Form with the discount coupon. If you want to make the payment with your checking account or further assistance call us at 703-229-0326 or send mail to support@tax2efile.com. Stay ahead with other tax filers and receive the Schedule 1 before all. We are always happy to serve you better. E-filing HVUT Form 2290 with ETax2290.com, Pre-file with Discount Coupon! Are you waiting for discounts to pre-file your 2290 tax form, hurry up! Etax2290 is offering flat 25% off for the pre-filing customer up to June 30, 2017. Limited Offer. Etax2290 started Pre-filing your HVUT Form 2290 for the tax year 2017-18. You can pre-file your IRS 2290 Form through etax2290 electronically. We have your tax filing safe and secured. When the IRS starts receiving the HVUT Form 2290, our system submits your electronically filed tax return to the IRS. When the IRS accepts your Form 2290 you will be notified and you will receive stamped Schedule 1 in your email. As an experienced tax filer, you might be aware of the benefits of pre-filing and it is time to act fast and pre-file your IRS 2290 Form. This year Etax2290 complements its valuable customers in this pre-filing tax season with a discount of flat $5 discount for the Single Truck filing fee. Exciting, right? How to get this offer and the discount coupon? It is very simple. All you have to do is to like our Facebook page to get this discount coupon. A single “like” earns you $5 discount. So what are waiting for? Just hit “like” and avail your discount. Apart from that, you can avail flat 25% off on Form 2290 E-file Fee. For more details contact our customer support team via chat, email or call. Click and Like ETAX2290 Facebook page https://www.facebook.com/Etax2290. Go to the Coupons section, which is available in the left section of the page. When you do so, a redemption code will be provided. This voucher has a created date and Expiry Date. You can print the voucher if needed. Importantly, you can share this offer with your friends by posting this on wall, twitter or through the mail. All you have to do is, click the appropriate button to share. Now you have obtained the coupon code to apply while filing single truck. So that, the filing fee $5 amount will be reduced from $19.99. Register or Log in to Etax2290.com. In the pay for service tab, you can find “Discount on your payment”. You can fill the Coupon Code in the given text box and click Get Discount. The payment after discount appears in the text field. Then you can fill the Credit Card and Billing information and click pay now. Now you are done with your HVUT Form 2290 e-filing with the discount coupon. If you want to make the payment with your checking account or further assistance call us at 703-229-0326. Stay ahead with other tax filers and receive the Schedule 1 before all. We are always happy to serve you better. Are you looking to form 2290 season? Etax2290 is accepting HVUT Form 2290 online with many other benefits and lowest price. Form 2290 must be filed by the owners of the heavy vehicle such as tractors, trucks or buses with a gross weight over 55,000 pounds and use public highways for transportation during the tax year of July 1 to June 30. Listing few of the benefits that why our customers pick Etax2290 services to file their HVUT 2290 Tax Form via Etax2290 is as follows. When you e-file your Form 2290 online, you no need to worry about the hard copy miss. We often mess with the paper works and miss them. But when you e-file your Form with us, your file copy is stored and can be retrieved back when need. Filling your Form 2290 online saves much of your time and its easy for a starter too. While you file with Etax2290, you no need to wait in IRS office to file your IRS 2290 Form. Compared to paper filing, Etax2290 online filing is safe and secure. We maintain high data security and maintain your records with a lot of care. Etax2290 keeps your data organized. You can add all your fleet details in your provided account and the online field information is stored. So that you can easily track all your details for future reference. When you file with us, your application is processed quickly and your stamped Schedule 1 is issued in minutes. With immense experience in the field of tax filing, Etax2290 provides a professional service and guidance while filing a Form 2290 online. So your application is error free and there is no delay in your application process. Etax2290 tax experts calculate your taxes accurately and file them accurately without any mistakes. When you own a dozen of fleets but not able to monitor them, we Etax2290 can support you. We can handle bulk data and file them efficiently. All your data are stored in your provided account and you can initiate your filing process from anywhere you want. The main reason, why Etax2290 is against paper filing is that we support eco-friendly environment and we say no to papers. Above all, when you are stuck up in the middle of the filing process, etax2290 customer representatives are here to help and answers your queries anytime. And if you are a first-time tax filer, we are happy to help you throughout the process. We understand and care our customer needs. So with no further delay, join us here and get started today. Call (703)-229-0326 to talk to our customer support team to e-file your 2290 Form. State governments depend on federal government for any inter-state relationships which is very natural in any democracy but much indispensable and true to transporting industry for moving things and products between and across states of USA. Though they do for public and government interests, it is inevitable to note that most states may have different policy structure and may be according to the constitution of USA but when it comes to the matter of security of the USA nation as a whole, state governments have to give-in and answerable to the federal government. Therefore the applicable certain regulations of transporting of goods for public or government between states of USA and across states of USA must fall in line with the guidelines of the federal government wherein comes the importance of moving things, products or whatsoever as applicable and allowed for the transporting industry that operates as a business. The primary thing follows the rule of the owner of trucks or fleet-owners for whatever number of heavy vehicles that they may operate must compulsorily file their excise tax form 2290 on time or with penalties and as a result of schedule 1 that they possess and shown is customarily followed up by every state government check-posts inside USA to check on any heavy vehicle under stratified law in spite of state heavy vehicle registrations. Here there cannot be any moderation to prove that how vital it is for the transporting industry to e-file excise tax form 2290 on time or even with some penalties to possess schedule 1 for easy transporting on national highways and this holds good for truckers or fleet-owners to have any say in this law against the security of the nation. Follow the road excise tax 2290 by paying on time and follow the rules of the government will certainly reap rich harvest for the trucking industry after all they are the ones who strive hard to do the needful for the societies, communities, cities and the country through their hard work by reaching the destinations for senders, receivers and for wants and needs. Truckers are gratified as we hope and as they are the ones to make the nation moving and USA is looking forward for the future prospects of development in terms of economy and consistent growth of the nation. Movers- the truckers and fleet-owners, move the world with eligible capacity with no hurdles across states of USA by e-filing form 2290 for schedule 1 through IRS certified partner ETAX2290.com for transporting important needs of the people and the government and as well as for self truckers’ business growth and development. Heavy vehicles are used for many different transportation needs across the world. The IRS tracks the use of these vehicles through IRS form 2290. The HVUT (Heavy Vehicle Use Tax) 2290 form collects information only from companies with larger fleets of vehicles, and it is an important form to file. Heavy vehicles are used for many different transportation needs across the world. The IRS tracks the use of these vehicles through IRS form 2290. The HVUT (Heavy Vehicle Use Tax) 2290 form collects information only from companies with larger fleets of vehicles, and it is an important form to file. The website EtaxForm2290.com provides an easy and affordable way to file this form with the utmost accuracy and simplicity. Only companies with fleets totaling 24 or fewer heavy vehicles may file form 2290 tax on papers; all other companies with heavy vehicles are required to file online. This could be a single fleet of 25 vehicles, or five fleets of five each. A “heavy vehicle” is defined by the IRS in this case as one that has a gross weight of 55,000 pounds and traverses at least 5,000 miles of highway roads in the United States for the year in question. This tax form is filed by the individual drivers of each truck. The point of filing online for larger companies is for simplicity and expediency on both ends. Filing electronically may seem trivial due to the fact that it has a cost, however menial it may be. The advantages of using e-filing far outweigh the price. By registering, one of the opportunities users are given is the chance to amend their Vehicle Identification Number, or VIN. Entering the wrong VIN is the most common mistake on this form, and the online tax filing software ensures that users are not charged twice for this simple error. The software also offers excellent live support in the event that anything goes wrong or users have questions. Representatives are available for instant messaging chat, e-mails, and phone calls. For those who wish to form a long-term relationship, discounts on the already excellent price are available. And finally, anyone who files with EtaxForm2290 will be assigned a dedicated representative so that time is not wasted explaining past conversations and issues in subsequent situations. Despite the excellent service, the cost will surely be a deciding factor for many. The price varies by the amount of vehicles and the type of service desired. Standard Gold service is what most users will be looking for; this is for those who are seeking to file through the website one step at a time. It is the easiest and most popular option. A single 2290 form qualifying heavy vehicle will cost $19.99, or $14.99 with a coupon from Facebook page. Those filing for 2-24 vehicles pay $24.99; 25 to 100 vehicles costs $34.99; 101 to 250 costs $49.99, and 251-500 costs $94.99. The last two options are relatively rare, but a company with 501-1,000 heavy vehicles to file for will pay $149.99, and anything over that costs $249.99. Filing the 2290 IRS form can be as easy as following words on a screen. With EtaxForm2290, there is very little possibility of error. Users can expect great prices, fast support, and fantastic results. IRS Form 2290 Taxes Driving You Crazy? Filing taxes can be a difficult and time consuming process. Many find this activity to be one of the most stressful events of the year. Those who drive commercial trucks qualifying for IRS form HVUT 2290 may find it even more so, as this is just one more form requiring completion at tax time. Instead of worrying, many have relied on Etax2290.com to make IRS 2290 filing simple and painless. What is Tax 2290 Form? Form 2290 tax is a tax collected by federal government for trucks using the US highway roads. The website Etax2290.com is designed to provide its users with an efficient way to complete their taxes on time with as little hassle as possible. The process is as simple as registering and following step-by-step instructions until the form is complete; then Etax2290 sends it directly to the IRS. Perhaps the most useful feature of the site is that it provides easy and reliable support if customers ever have any questions or issues that need to be resolved in order to meet the form 2290 due dates (which, in most cases, falls on the last day of August). Web chat, e-mail and phone are all available options for customer support. Users also have the ability to send in their information via a Microsoft Excel spreadsheet if they wish to expedite the process even further, though first time and/or individual filers may find it better to use the step-by-step process. Cost, ofcourse, is a large factor in determining whether or not it is worth it to avoid the anxiety. The short answer is that it is absolutely worth it. For those who are filing individually for a single truck, the cost is a meager $19.99 (or less with the $5 coupon from Etax2290’s Facebook page). Filing for two to 24 vehicles is only $24.99. After the 25 vehicle mark, all companies are required by the IRS to file electronically, so at this point it is only a matter of who to choose - and with Etax2290’s rates, the decision is clear. The cost proceeds to rise at varying increments up to $249.99 for any number over 1,000 vehicles. This is called the “gold” option. There is also a diamond option; this price varies as well and must be discussed with a representative. This is the option for those who wish to send their information in as a spreadsheet. Finally, platinum users are those who are filling out the forms as a Tax preparer for other customers who operate heavy vehicles. Figuring out whether or not to file is simple. Firstly, the vehicle must have a gross weight of over 55,000 pounds. Second, the driver must drive at least 5,000 miles in the given year on any United States highways. Finally, any company or fleet owner with 25 or more vehicles does not have the option to file on paper. Using Etax2290’s services is a wise decision for anyone who must file the HVUT 2290 form. It is quick, cheap and simplistic. Form 2290 due dates never need to be missed again. This blog is a part of Etax2290.com which is an IRS authorized tax e-file services provided by Yakshna solutions inc, which is a leading provider in the tax industry. We offer customized tax filing packages for individuals and fleet owners. Register now and start filing your Form 2290 tax today and avoid any penalties.